Is there life after death? : Ectoplasm: Real or fake? First of all, what is ectoplasm? The term "ectoplasm" was coined by a man named Dr. Charles Richet which comes from the Greek words ektos ("outside") and plasma ("something formed or molded"). According to Dr. Richet, Ectoplasm is (quote) "a whitish substance, that creeps as if alive, with damp, cold, protoplasmic extensions that are transformed under the eyes of the experimenters into a hand, fingers, a head or even an entire figure". Ectoplasm is said to be a substance that excretes from the body of a medium (usually through the mouth, sometimes ears and nose), a substance which spirits from the other side use in order to manifest themselves in our physical reality. The spirit entity will use the substance of ectoplasm to form physical body parts such as hands and arms or even a voice box to speak with us. 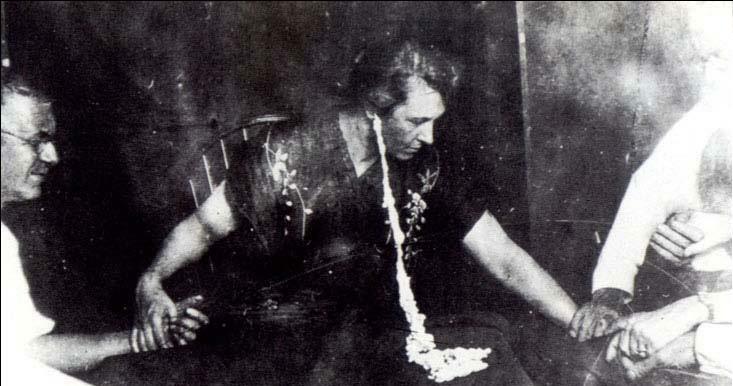 Ectoplasm is said to be made up partly of white or colourless blood cells extracted from the mediums own body. Only a small number of mediums are said to be gifted in this area and the process of bringing forward spirits via ectoplasm is known as materialization mediumship. The whole process needs to take place in total darkness, due to the ectoplasm substance being extremely sensitive to light. It is even said that sudden exposure to light or other disturbances during the materialization can cause direct physical harm to the medium. The materialisation of spirits via ectoplasm was popular many years ago in victorian times, but we rarely see it today. There are however still a small number of mediums who continue this practice. The skeptics of course say that the whole thing needs to be carried out in total darkness because it is all a trick and that the reason we don't see much of it today is because the hoaxes and scams must of all been unmasked and exposed in the past so no one can get away with it anymore. Furthermore, skeptics claim that the "ectoplasm" itself is nothing more than cheesecloth, which gets stuffed into cavities of the body and then regurgitated during a seance. It must be admitted that the old photos of ectoplasm do simply look like a conjuring trick using cheesecloth or other substances and it is easy to understand why at first glance, most people would dismiss ectoplasm as nothing more than an elaborate hoax. However, a closer examination of the subject leaves me feeling unsure. For starters, many high standing men of science came to the conclusion that ectoplasm is genuine. Charles Richet himself who coined the term was a physiologist, bacteriologist, pyschologist, chemist and a winner of the nobel prize in 1913. Hardly the kind of individual you'd expect to be easily duped by a hoax using cheesecloth. The idea that "all the mediums got exposed as hoaxers" in the past is simply not true. Quite the opposite, in fact many records can be found of materialisation mediums who were in fact scientifically studied under carefully controlled conditions - bound to a chair, and in some cases gagged. The kind of amazing phenomena that has been documented are not things which any stage magician has been able to duplicate either. There are numerous convincing cases of materialisation mediumship documented and if one takes the time to research into ectoplasm and materialisation mediumship a little more deeply than the initial impression of it, there is a wealth of information there which will make you at least question if it could well be possible.